Since living in Western North Carolina, one of the creatures we get to share our world with are wild turkeys. They are large birds that have long legs and look far more sleek and athletic than the round, domesticated birds we all associate with Thanksgiving Dinner. The turkey drawings here on Reusable Art are a mixture of turkey drawings – a bit of everything. 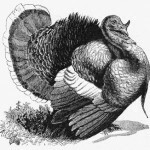 These copyright free bird images are in the public domain and can be added to your creative projects where you need a picture of a turkey. 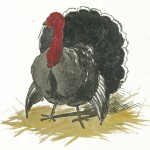 Looking for a fancy turkey drawing or great image to use with Thanksgiving? 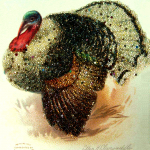 This shimmery fellow might be just what you need. Drawn by Ellen Clapsaddle. 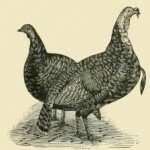 Vintage drawing of a pair of Cambridge turkeys. 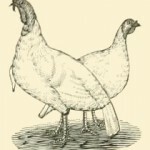 Black and white drawing of White Holland turkeys. 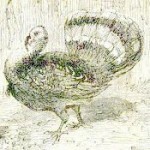 Small, vintage drawing of a turkey. 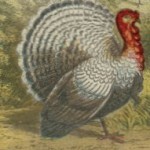 Small, colorful public domain turkey image. 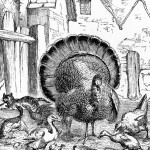 A turkey appears to be in charge of the barnyard in this public domain bird drawing. Partially colorized drawing of a proud turkey. A mother turkey leads her goslings for their first swim. 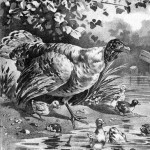 Vintage, black and white drawing of a male turkey. 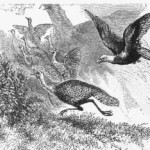 A group of turkeys flee an approaching eagle.